This printmaking uses very simple techniques involving en-graving and embossing styrofoam plates. (You can encourage students to recycle meat trays from the supermarket, or trays from a deli.) Students are asked to explore any theme that interests them and do preliminary drawings in charcoal. Subsequent Prints are based on these drawings. 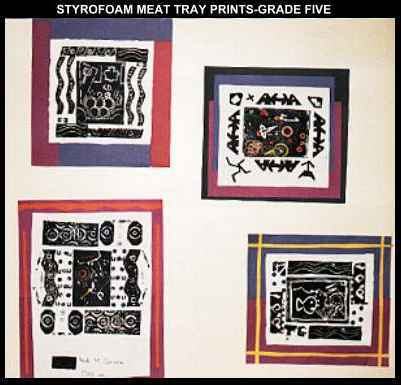 Using a tool such as a blunt pencil, carve or engrave lines, dots and larger flat areas into the styrofoam. Experiment with a variety of marks and shapes, including pressing small objects into the plate to make an impression. One session can be devoted to preparing the plate. Subsequent sessions should involve smaller groups who are taken to a printing area (see below) to ink their plate and pull prints. One good proof in retained while another can be enlarged and embellished with further printing, drawing or stencil-ling. Younger printers may enjoy colouring their rint with magic markers. You will need to create a "clean" area where the actual good print is worked and not contaminated with ink. The "dirty area" will have been covered with newspaper to protect the table. A pile of newspaper is available to place the plate on while it is being inked. Replace this with a clean one for each inking. A large piece of glass or even masonite is used to roll out the ink with a rubber brayer. Water based ink dries very quickly and becomes unworkable, so dispense the ink in smallish quantities and stop every now and then to clean the glass of dried bits of ink. An ordinary triangular scraper from a hardware store is a good tool to scrape spread out ink occasionally back to a little discreet pile. Roll the ink out evenly by picking up a bit on the roller, rolling it thin and even on the glass(pick the roller up each revolution to present a new surface to the glass for each pass)and rolling it once or twice over the plate. You will need to reload the brayer (roller) frequently and pass over the plate in all directions until it is thoroughly covered with a thin and even coat. Too thick and it will begin to fill up the finely engraved lines...too thin and you will get an uneven, ghostly print. Remember this takes a bit of practise and experience. If the ink starts to get too dry on the glass, a fine mist of water from a spray bottle and a little working with the scraper can salvage it. Plates can be inked and printed about six times before the image starts to deteriorate. When the plate is nicely inked take it to the clean area where you will place the plate face up allowing for a border edge for the paper. Gently place the paper on top of the plate starting at one corner and "laying" it on to prevent the paper moving in any way and smudging the image. With a clean hand, press all over the back of the paper to adhere the plate. Then burnish the whole area with the back of a spoon to transfer the ink to the paper. You can lift a portion of the print from the plate to check on the impression without detaching it completely. When you are satisfied with the print slowly "pull" it off the plate while holding down one corner with your finger. You will use the same method but on a very small piece of styrofoam ( about 2" square or 2'x3') Make a simple design such as a spiral or lightening bolt or starburst. It also looks better if you incise some kind of border around the rectangle. Don't confine the design to just line, but experiment with pushing down all the background and leaving the design itself raised. When satisfied, you will have to glue the thin styrofoam to a thicker piece such as insulation board cut to the same size. This is so you have something to hold onto while inking and pressing it onto the skin. Asured your customers that the ink is washable and that it needs about five minutes to completely dry before coming in contact with a sleeve etc. When applying the tattoo, instead of pressing it straight down, sort of roll it onto the skin.